This Pedal Spacer (Pedal Extender) is for Look Keo (and related pedals ) that need a Hex Key Wrench for installation. 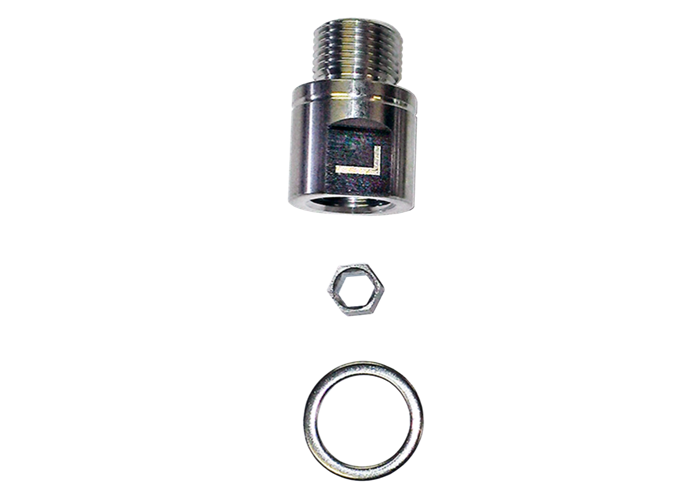 This Left Only (non-Drive Side) 20mm Hex+ Spacer (Pedal Extender) kit (washer and adapter with 20mm Spacer) is used with a knee that tracks outside the pedal by adding length to the pedal axle. This improves alignment and alleviates knee pain. This Pedal Spacer (Pedal Extender) Kit is intended for pedals that DO NOT have wrench flats on the pedal spindle (pedals that are attached to the crank arm with a 6 or 8mm Hex Key). Not intended for use with Carbon Cranks. Our LEFT stainless steel Hex+ (20mm) Spacers (Pedal Extenders) are used with knees that track outside the pedal by adding length to the pedal axle. Designed to move the foot out and away from the crank arm to provide more foot clearance, they add to stance width for cyclists needing help with knees-out, excessive toes-out, extra wide feet, wide hips, or for those with discomfort on the outside of the knee. These Pedal Spacers (Pedal Extenders) are intended for pedals that DO NOT have wrench flats (pedals are attached to the crank arm with a 6 or 8mm Hex Key). Designed with a thru-hole to allow a 6mm Hex Key for attachment.